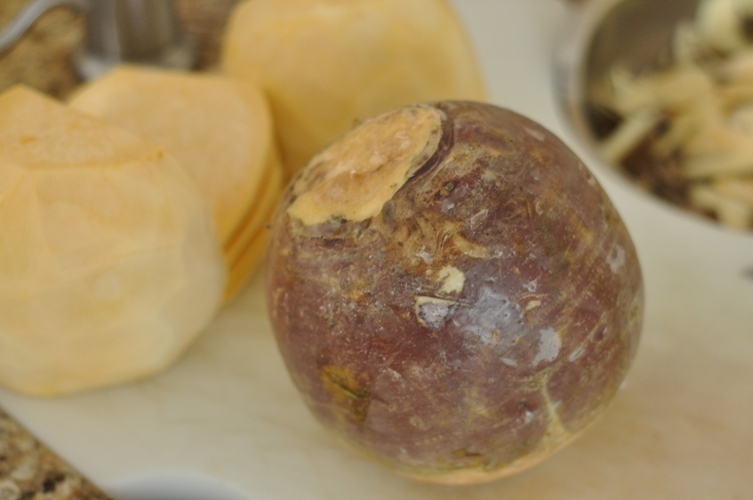 Canadians and Americans use the term Rutabaga, while Australians use the word Swede, the Irish refer to them as Turnips, and the Scots call them Neeps (I think the Scots say it best). Whatever you decide to call this root vegetable one thing is for sure it can be prepared in a variety of ways. 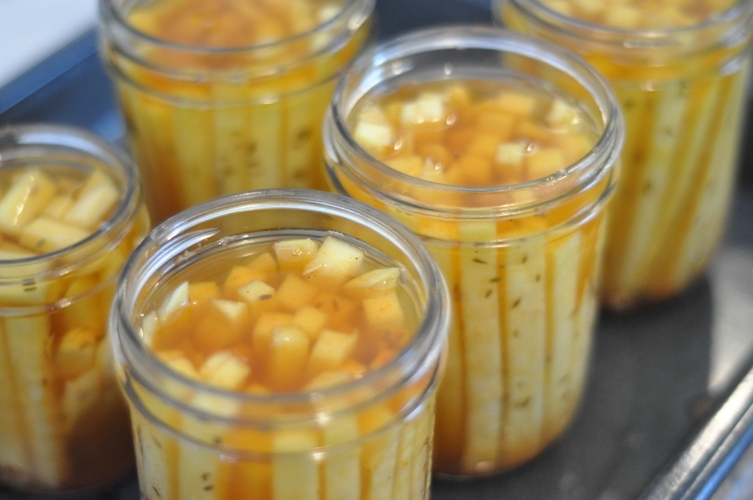 This recipe comes from Liana Krissoff’s book Canning For A New Generation. 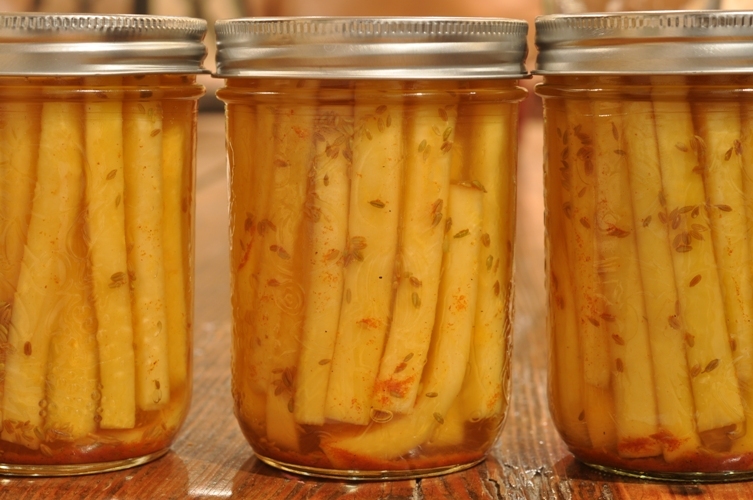 Like so many of her preservation recipes, Liana takes a common ingredient and puts her unique spin on it showing us that canning is anything but ordinary. Wash, peel, and cut your rutabaga into strips. Place the rutabaga strips in a large bowl. 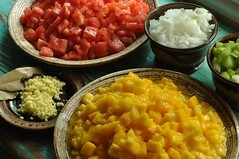 Dissolve the 1/4 cup salt in 1 litre of water, then pour the brine over the rutabaga to just cover them. This amount of salted water did not cover the rutabaga so we doubled the amount of salt and water. Leave to stand for 8 to 10 hours, or overnight. 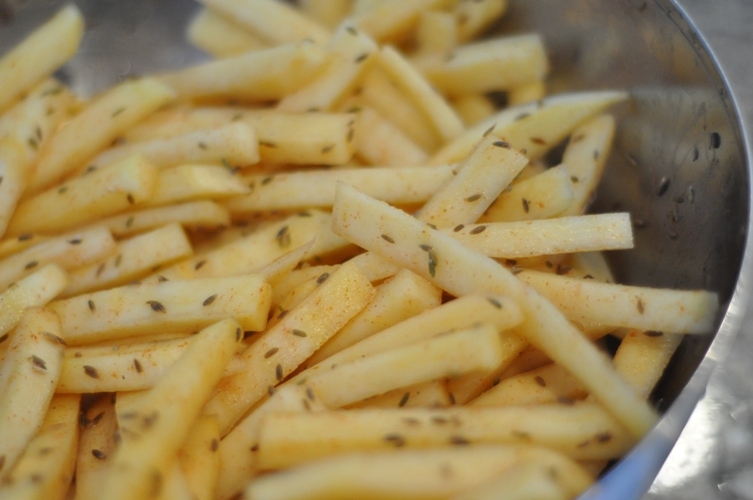 Next day, drain the rutabaga, then add the lemon juice, toasted cumin seeds, paprika, and cayenne. Mix well to ensure the strips are covered in the seasoning. Set aside. Prepare for water bath canning. Sterilize jars in the oven at 250F for 20-30 minutes. 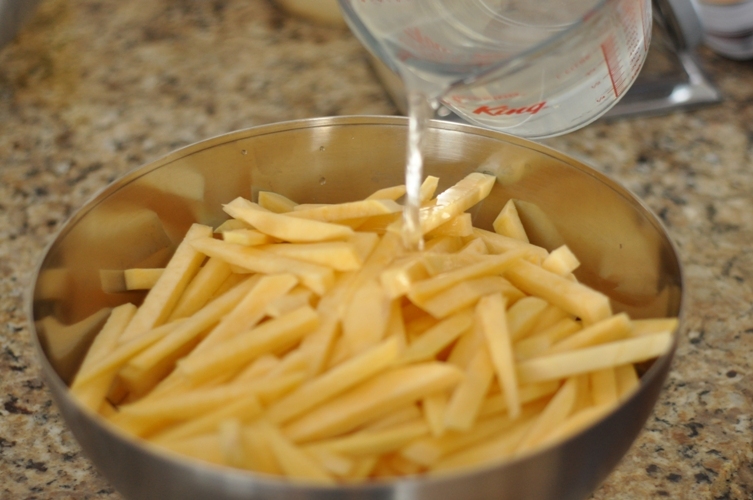 In a stainless steel saucepan, combine the vinegar, 1 cup water, and the remaining 1 teaspoon salt. Bring just to a boil. Working quickly, pack the rutabaga into hot sterilized jars, and equally divide any juice remaining in the bottom of the bowl. Ladle the hot brine into the jars, leaving 1/2″ headspace. Remove any air bubbles (there were lots of bubbles) and if necessary, adjust headspace by adding more of the vinegar mixture . Wipe rims using a damp paper towel. Center lid on jar and screw band down until resistance is met and then adjust to finger tip tight. Place jars in hot water bath ensuring they are completely submerged. Bring to a full rolling boil and process for 15 minutes. Turn off heat, remove lid and let stand for 5 minutes before removing jars. Check seal, label, and store. Refrigerate any unsealed jars. With little flecks of cumin seeds floating about, these golden-yellow rutabaga strips look like they are glowing in the slightly orangey vinegar. If they taste as good as they look we will consider it a success and possibly make a second batch before the winter is over. Liana recommends using this pickle as a side for hickory smoked pork but I can see us setting a jar out on our bar counter for friends to nibble on as they put down a pint. I think this is a great recipe for first time canners to try before we get into the throes of canning season this spring/summer. It is relatively easy and will get your feet wet and ready for some water bath canning. The hardest part of this pickled preserve is peeling and cutting the rutabaga (they’re tough and solid guys which require a good knife and an experienced hand). Matt made it look easy. Side Note: this is more for my records than anything else…Canned a 2nd batch of Bloody Good Marmalade. I got so excited to can these until I saw the lemon juice. Another recipe that will have to wait until April. That looks great. They’re one of my favourite vegetables. And since you had such a detailed name list – here in Norway we call them kålrot (or kålrabi) – kål=cabbage and rot=(surprise, surprise) root. It’s amazing the number of names for this root veggie. Even in the store today a young man asked are these “turnips…then, why does the sign say rutabaga”? Thanks for sharing. Kalrabi (I’m not sure if that’s how it’s spelled..) in America is a cabbage tasting, green, spiky looking thing. How strange that the same word can describe two very different vegetables. Those jars look so pretty! I love rutabagas raw or roasted, so it never occurred to me to pickle them… Silly me, of course they’d be yummy, I don’t know a root vegetable that isn’t tasty when drowned in vinegar! By the way, for some weird reason, in the UK, rutabagas are called swedes! I meant to say ‘in England’…. Going to try and begin making these tonight. 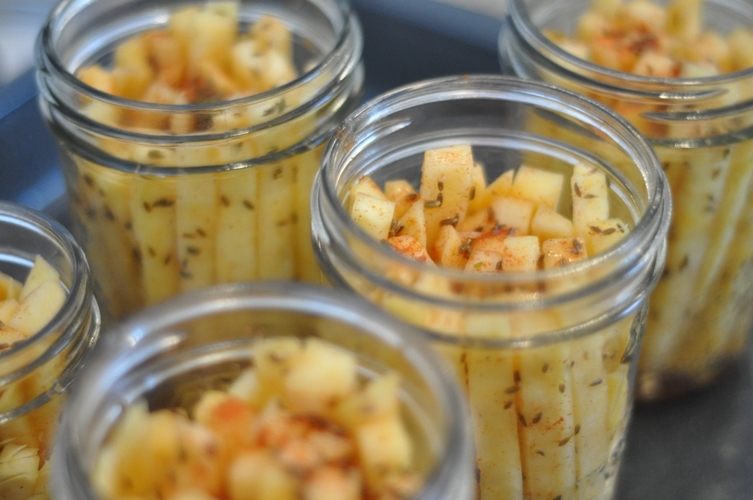 Fill a jar with rutabaga sticks, place an orange habanero and or hot cherry pepper (with just the stem/cap cut off) on top with a few fresh garlic cloves. Fill with a vinegar, water and salt brine (salted to your taste). Cook for 20 minutes. AMAZING and couldn’t be easier. Thank you Leslie!! Looks like a wonderful one to try…our pickled rutabaga strips are delicious in Asian wraps. Mmmmm!